This was an experiment for making something different this week, the original idea was to make a club sandwich, but we ended up with the result you see above. 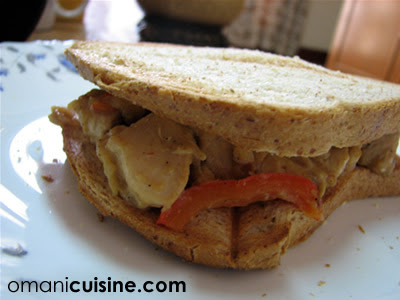 The boring chicken sandwich was saved by the creamy sauce we added to it. This is a simple snack that you can make, check out the ingredients and method below. In a small pot over low heat melt the butter. Add the flour immediatly after all the butter melts – make sure to stir the mix while adding. Add the milk gradually while stirring to ensure that the mix blends properly. Add half a mug of water to mix and keep on stirring. keep stirring. (Now you understand why this is boring) Stir from time to time for a period of 10 minutes. You should get a thick white cream. You can adjust the viscosity of the cream by adding more water. Once done leave covered on the side. Crush the garlic clovers with the chillies and the Nandos spices mix. Melt some butter on a fraying pan. Fry the minced onion and capsicum slices on the pan for four minutes. Add the chicken to the mix and fry while stirring until the chicken turns white. Add the crushed spices mix with one tbsp of vinegar to the chicken mix on the pan. Add half a mug of water, cover the pan and leave for 5 minutes. Remove the cover and wait for all the water to evaporate before adding the cream we made at the beginning. Stir the mix until cream is absorbed by the chicken and the mix is creamy. Take out and serve with toast as sandwitches.